If you didn’t get a chance to check out this summer’s superhero action-adventure blockbuster from Sucker Punch Productions, well, now is the perfect time to do so. Just in time for the holidays, we’re excited to announce that inFAMOUS is now available for $39.99. If the new price point’s not incentive enough, beginning on December 10th, Cole’s ‘Gigawatt Blades’ Super Power, will become available for FREE on PlayStation Network. The Gigawatt Blades supercharge Cole’s arm into blades of pure energy which can be used to cause massive damage against enemies during melee combat. In other inFAMOUS news, the official game soundtrack which features three previously unreleased bonus tracks will be released December 8th to retail outlets through Sumthing Else Music Works and is now available for digital download on Sumthing Digital. And one special final note, we’d like to send out congratulations to Sucker Punch Productions as inFAMOUS has sold over 1.2 million copies as of October 2009 – congrats guys! Congrats Sucker punch! Now please some new DLC? Congratulations on your Achivements. inFAMOUS is also a Platinum game in Europe, so I’ll be getting it at a reduced price as well. I do have one question. Will the GW Blades be free too in the EU store? I second that! I would love to spend more time on the game. My second favorite game of the year, right under Uncharted 2. When can we expect to hear about SP’s next installment? E3 2011? The game should of sold even more, it has a few issues here and there but the story and gameplay are pretty damn solid. sweet. i dont remember if i unlocked those or can it only be gotten thru DLC? woot woot, Glad it’s sold 1.2 millin so far. It’s an awesome game. Great now i know there will be sequel. Great game and anyone who hasn’t played it needs to give it a try plus a very attainable platinum. Any news of a DLC coming? I would totally pay for a new island. All the incentive in the world won’t save the game. Can you guess why it’s cheaper?, With free content? It’s because the game isn’t selling that well! They sit here and act like they are doing us all a favor lol. You see COD MW2 Or UC2 With a price cut? Nope not gonna happen for awhile. Don’t look for a Infamous2 anytime soon. The game was “OK” But the hype was a big let down. WELL-DESERVED 1.2 million copies. This was a fantastic open-world game that I actually enjoyed throughout (and I RARELY finish these types of games). If Uncharted 2 did release this game, inFamous would have been by Game of the Year :) So any word on inFamous 2? Too bad it was a let down for you. For me, along side Batman Arkham Asylum, its the best superhero game ever made. In my estimation this game wasn’t hyped enough and launched alongside the laughably mediocre Prototype, which stole some of its thunder. Congrats SUCKER PUNCH! You made an excellent game, and i hope we get to see more of Cole and inFAMOUS in the future!… I’ll be downloading the blades as soon as I can to try them out.. So selling over a million copies isn’t selling well? Next time you feel like disrespecting a game because of your lack of knowledge, do some f@#$King research. And for inFamous being just an “OK” game, that your F@#$king opinion and no one cares about your opinion. And UC2 has gotten several price cut by retailers, not Sony, over the past month or so. Why haven’t you patched in the ability to find left over shards once you finish the game and enter sandbox mode? You will never see an Infamous 2 purchase from me until you actually deliver on what fans have been begging for since DAY ONE! Incompetence may be tolerated on XBL, but not PSN. Very awesome. Amazon.com is selling it for $37 with free shipping. I have $10 of gift card credit at Amazon, so I’ll be getting it for $29 after tax. Hurray for the holidays! This is going to be soo cool even though i have beaten Infamous like 10 times and gotten alot of the trophies this will make me want to play it again. Also don’t do a subscription fee that would be stupid. But if you do, do the fee then make it so that you only have to pay that one fee monthly and you can then download anything (free or not). Sweet, I haven’t played this game yet, looking forward to getting it soon. Improvements all over, but extra effort put into the realtime cutscenes please. @11 Dude! If you think that selling 1.2 million is not selling well, then this must be your first-gen playing video games. Sony gives us choice! We have the choice between so many different genres scattered among so many different games, and I am only referring to first party. Whatever you like, you can find a game on the PlayStation 3, PSP or PS2. Sony does not rely on ONE game, ONE franchise and ONE genre to sell. Granted, I would assume, developers would like to see their games sell 4 millions first week, but in the long run, making more games, giving the fans more variety is a better business decision, and developers will get more respect and better reputation. If you think I’m wrong, what other games have Bungie and Infinity Ward have done? Good devs? no doubt, but they haven’t proved that they could sell the same amount with other games. IMO, I would prefer to have 2 or more games ,GREAT GAMES, that sell 1-3 million, than ONE game OVER and OVER, and OVER again with little or no improvement.. I borrowed it from a friend and LOVED it, but I’ve been hoping it would be lower than $60 for a while. I saw it at $40 on Cyber Monday (and got $20 of PSN credit at Amazon) and I’m so glad I’ll have it in the mail soon (though I may save it so I have SOMETHING for Christmas lol). i love free stuff – thanks guys! can’t wait for inFamous 2! perhaps the new protagonist could be cole’s twin sister separated at birth! come on, we need more female heroes! Did you play inFamous and finish the game? Because once you beat the game, you can continue after and collect the shards and finish the side quests. Well said my friend…well said. Great game, but it does get repetitive at times. The sequel should be a nice improvement. I’d still buy some DLC if they decided to go that route. If I didn’t have to get AC2 I would have gotten these instead. Awesome… Infamous was definitely one of the better surprises for me this year. It wasn’t on my radar at all, but I bought into the hype and tried it out and it ended up being one of the best new IPs I’ve played since Uncharted… and of special note was that it may be the only game where I’ve found playing as a good guy even MORE rewarding than playing as a bad guy. You obviously have not played throught the game because when you beat the game you DO have the ability to find the left over shards! You can also finish any side quests! Even when all that is done there are still a few lingering bad guys to mess with when there is absolutly nothing else left. I’ll just play it again. Great game guys! Looking forward to jumping on this @ the new price point. Hey Asad or Jeff or Chris, why don’t Sony make available more retail games on PSN, just like Warhawk, Socon and Burnout Paradise that are available both from retail and PSN. Many people like buying games directly from the PS3. If you don’t yet own this game then get out there and buy it now, it was worth the full price but with the price cut in the US and it being part of the Platinum range in Europe there’s no excuse. It’ll be money WELL spent I promis! A great game and I bought it at full price and am not sorry. Thanks for the freebie on Dec 10th as well…very much appreciated. But I wait for greatest hits :D still really excited about this game though. Fantastic game. Thoroughly enjoyed it. If you don’t have this game this is a perfect price to pick it up. You will not be disappointed. Looking forward to Infamous 2! Congrats on the sales and I thoroughly enjoyed playing the game and grabbing that platinum. The biggest complaint I had with the game is there was NOTHING to do once you finished it, completed the missions, and found the shards. It would have been nice if there was an option to re-populate the islands with the gangs, or a challange mode where you have to take on waves of enemies. Great game though and I look forward to the sequel. This is my pick for Game of the Year 2009. 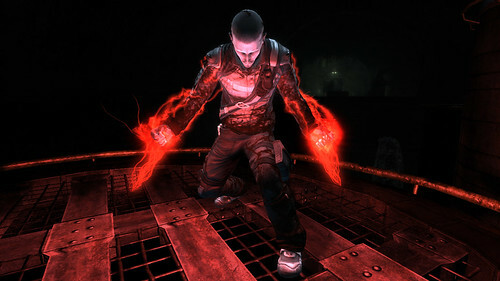 Can’t wait for inFAMOUS 2. InFamous was awesome and I can’t wait for the sequel! Congrats! Bought this game day one and still play it on occasion. Just got mine yesterday from Amazon. w00t! Can we stop the Back to the Future references please? I’m getting tired of them. Congrats Sucker Punch on a great game! I already have the platinum for this game, but the blades will definitely have me come back to play. Sony really put their foot down this year. There are atleast 5 GOTY contenders IMO, and sony is 1st party to 4 of those 5 games. Great time to have a PS3. i’m getting it for sure!